Here's a movie entirely about people being mean to my girlfriend Zoë Bell. And that's not cool. The movie is called Raze, and it starts and ends with people being mean to my girlfriend Zoë Bell. With some of the people being mean, I get it. After all, it is about my girlfriend Zoë Bell and 49 other women being held prisoner and forced to fight to the death for the amusement of some rich assholes. If a girl refuses to fight, her loved ones are killed. If she loses, she dies. Also if she loses, her loved ones are killed. It's a terrible situation for these girls (among them Rachel Nichols of G.I. Joe: Rise of Cobra and Rebecca Marshall of Saw: The Final Chapter) to be in, so I can't really blame them for being mean to my girlfriend Zoë Bell and trying to kill her. They're just protecting their families. My girlfriend Zoë Bell, playing a character named Sabrina, is protecting her family, too. She has a young daughter whose life she is saving every time she beats another girl to death with her bare fists. No, the real meanies of Raze are the married couple played by Doug Jones and Sherilyn Fenn, who are the ones keeping the 50 women prisoner and throwing the lavish parties during which these death fights occur. Why only women, I'm not sure. Why my girlfriend Zoë Bell was picked, I'm not sure. Why they're really doing it in the first place, I'm not sure. I'm guessing it has something to do with the wealthy class exploiting the middle class for their own sick entertainment, because that's what most social commentary in movies boils down to these days. As political subtext goes, it's not very interesting. And it might even be giving Raze too much credit, as I'm still not certain the movie has more on its mind than updating the "women in prison" genre from the days of 1970s New World Pictures and combining it with the Saw series. But giving Raze too much credit is exactly what I plan to do, because that's how I roll with #HeavyAction. See, Raze is an action movie better studied than enjoyed, as it actively resists your enjoyment (unless you are the sort of person who genuinely enjoys closeup after closeup of female faces being smashed to bloody pools of mushy goo, in which case there are lots of other sites on the internet we would prefer you visit). There is no story. It is just a series of fights, with a title card before each one ("Sabrina vs. Jamie," etc.). There is hardly any character development -- just a couple of tossed-off lines about family members so we know for whom the ladies are fighting. One woman, Phoebe (Marshall), manages to stand out by being the most psychotic of the group; she's the one who actually seems enjoying murdering the others, meaning we wait the whole movie for her to get a beatdown from Sabrina. That fight needs to be something special. I don't think I'm spoiling anything when I say that it isn't. None of the fights are, which is another of Raze's problems. Plenty of good action movies have been built from a non-stop series of hand-to-hand fights (The Raid: Redemption being the best and most recent example), but everything in Raze feels pretty much identical to everything else. The room, very tiny, is always the same. The women (among them Tracie Thoms and a brief appearance by Rosario Dawson, making this a Death Proof reunion) all wear the same costumes. The camera stays in too close. The choreography isn't even all that different in any of the fights, which is a disappointment as it was one of the few areas in which the individuality of the characters might have been expressed. And because there can be only one outcome to every fight, we mostly just count down as the numbers thin and we get closer to the final showdown we know is coming. As a movie, Raze is not particularly good. As an action movie, it's repetitive and upsetting, feeling in structure and tone more like a horror film that the usual #HeavyAction fare. But maybe...just maybe...maybe that's all on purpose. Maybe director Josh C. Waller and writer Robert Beaucage made Raze as the ultimate critique of action movies. In most cases, we action fans love the genre specifically for the fights. We get a thrill out of seeing two combatants wail on each other. One person usually "dies" at the end of it, but it's always ok because the film delineates who is good and who is bad. Raze turns us into those high society assholes watching people fight and die for our entertainment. It refuses to separate "good" from "bad." There is no one we want to win, as there is no one we want to lose. More than anything, though, Raze forces us to consider the families of its fighters. It's rare that we think about the wife and child left behind by the countless guards and henchmen that Arnold Schwarzenegger mows down with a helicopter gun or whose necks are broken at the hands of Steven Seagal. But because of the stakes built in to Raze -- that each time a character dies, we know her loved ones are being killed as well -- it's impossible to contain the bloodshed to just what is on screen. There can be no joy in watching these fights. They come at too high a price. And what of my girlfriend Zoë Bell? She's very good -- fierce, tough, physical, enraged, heartbroken. She gets to play emotions we haven't yet seen her play and proves that she's more than just a stunt woman asked to take the lead because she can fake fight. She's a real actress. Now I'm ready for her to take some roles that showcase how light and charming and funny she can be (like in Death Proof, but ESPECIALLY in Double Dare, the 2004 documentary about her and Jeannie Epper). 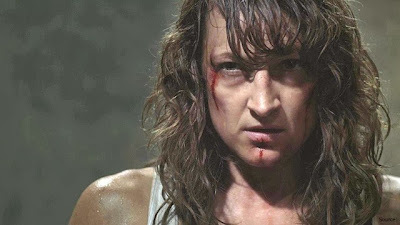 I want my girlfriend Zoë Bell to keep making action movies because she's really great in them, but the world needs to see more sides of her. So where does this leave Raze? It is unpleasant and repetitive. It consists of only fighting, and the fighting isn't all that good. It is brutal and feels more "real" than traditionally choreographed movie fights. It always ends badly and with us feeling sad. This all sounds like the movie works, as it seems to be the desired effect. But there is a nagging part of me that suspects we are still meant to enjoy Raze -- that we are supposed to find it cool and kickass and violent in the ways that we love our action movies to be. But it is not those things. It only works in comparison to other films in the genre. It is the anti-action movie. But if my girlfriend Zoë Bell asks, let's just tell her I loved it. Sometimes your reviews of bad movies are so good that I want to see the movie anyway. Usually it's those reviews that say something along the lines of "don't see it" - I always end up seeing it and hating myself for it. However, love this review and (for the first time) I'm totally fine skipping this one. Well done, you've talked me out of it! This is why you're awesome - But giving Raze too much credit is exactly what I plan to do, because that's how I roll with #HeavyAction.